Our nose is in the center of our face and therefore a real looker. A nose too broad or even humpy can disturb the aesthetic appearance of our face and make it somehow unattractive. A correction of the nose is one of the most frequently used cosmetic surgeries when it comes to the facial area. Due to the cooperation between our ENT-specialists and us aesthetic-plastic surgeons, we are able to offer a combination of functional and aesthetical surgery and therefore can secure and optimize the best result. A successful surgery enhances the self-confidence enormously and helps a great deal to bring back the inner and outer self into balance. The medical field of aesthetic surgery offers a few very good possibilities to give your nose a new shape when it is too big or too small, too broad or too long, when it is rather humpy, crooked or even a saddle nose. 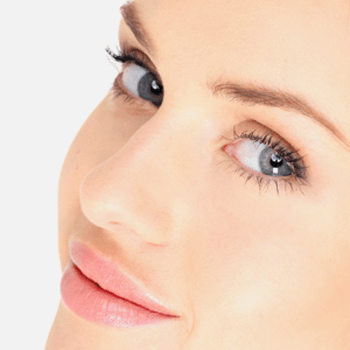 Too broad or too small nose tips can also give reason for a nose correction. It is not at all important if the shape of your nose is hereditary or was damaged in an accident. Adolescents should wait with surgery until their growth period has almost stopped. There are two options to correct your nose: the so-called closed surgery, done from the inside through the nose holes or the open Rhino plastic. Both methods are carried out under general anesthesia and take approx. 2 – 3 hours. After surgery the result is protected with a nose tampon (for approx. 2 – 4 days) and a plaster dressing which is removed after approx. 2 weeks. Swellings, bruises and after-bleeding are completely normal. In general the surgery is without any complication and scars also heal very well. The in-patient period is 1 day.